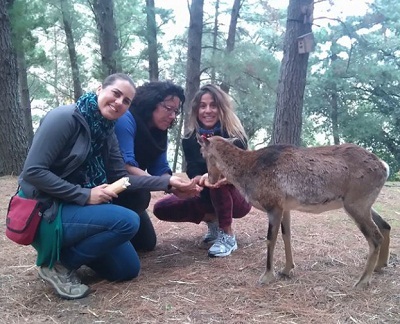 The visit (only upon prior reservation) of this nature conservation area offers the opportunity to see animals such as mouflons, deer or mountain goats, as well as birds that fly over us and the beautiful landscapes that offer mixture of forests and clearings. We offer a calendar of excursions and various workshops. Prepare your visit with your backpack, watter bottle, binoculars, camera and explore this piece of nature that we have made available to all the public for your enjoyment and learning process. During the visit, you will be able to closely observe several animal species that animals that coexist with plants and other living creatures in this environment with its diverse environments. >This form allows you to book a single individual annual pass for the Ecological Reserve of Ojén. This includes a map and a reference number that will allow you to acces the Reserve and its facilities for one year. > To make the registration valid, you will have to make the payment in cash during the first visit or on the account of UNICAJA ES74 2103 0161 0800 3000 5230 (indicate as title the Pass followed by the first name and then the surname and send a copy of the payment receipt to info@ecoreservaojen.com). > This information will be compiled in a database (not disclosed to third parties) for the sole purpose to obtain a register of passes issued each season and to inform you by email of activities related to nature photography in the Ecological Reserve of Ojén.